Did you see that there is no SLY STONE in this line-up? I'm sure it will rock and funk, but no Sly? Ouch. I would have put up a link to the Original Family Stone site, but as of this posting it was down. 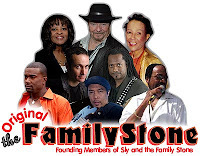 I played with a guitar player that had lined up a gig playing for Sly Stone way back when. Unfortunately, Sly had gone AWOL just before the tour. That was sometime in the 80's.